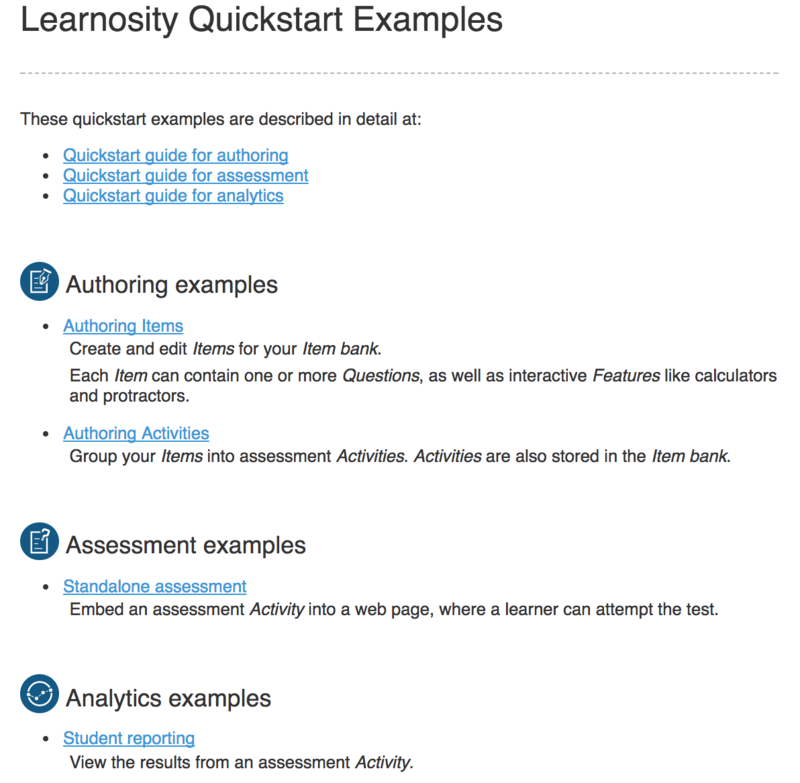 This guide describes the basics of embedding, configuring and working with Learnosity's Author API, a flexible authoring tool for creating Items and Questions and grouping them into assessment Activities. Your Items, Questions and Activities are all stored in your Learnosity Item bank. We'll set up a simple example page for creating learning content using Author API, then look at the code in detail. This quick start's server side code is written in PHP, but multiple languages are supported, such as Java, .NET, Python and more. If you haven’t done so already, download the Learnosity quick start examples using the link below, unzip them and configure your web server to use quickstart-examples-php/www as its document root directory. We'll assume that your web server is available at http://localhost:8000. The Learnosity Software Development Kit (LearnositySDK). The quick start example files. Once set up, you can load the examples index page at http://localhost:8000/index.html. The Authoring Items example can be used to create Questions and add them to your Item bank. See it at http://localhost:8000/authoring/authoring-items.php (or select the Authoring Items example from the index page). The Authoring Activities example can be used to group Items into assessment Activities. See it at http://localhost:8000/authoring/authoring-activities.php (or select the Authoring Activities example from the index page). Let's look at the code for the Authoring Items example. The source file is included in the quick start examples at www/authoring/authoring-items.php. We start by including some Learnosity SDK helpers - they'll make it easy to generate and sign the config options. mode: Here we set the mode to "item_list", for browsing and creating Items. Alternatively this could have been set to "activity_list" to browse and create assessment Activities. Next, we declare the Learnosity consumer credentials we'll use to authorize this request. These keys grant access to Learnosity's public demos account. Once Learnosity provides your own consumer credentials, your Item bank and assessment data will be tied to your consumer key. We construct security settings that ensure Author API is initialized on the intended domain. Now we call LearnositySDK's Init() helper to construct our Author API configuration parameters, and sign them securely with the $security and $consumerSecret parameters. $init->generate() returns us a JSON blob of signed config params. A div with id="learnosity-author". This is where the authoring user interface will be rendered. The <script src="https://authorapi.learnosity.com?v1"></script> tag, which includes Learnosity's Author API on the page and makes the global LearnosityAuthor object available. The call to LearnosityAuthor.init(), which initiates Author API to inject the authoring user interface into the page. The call to init() returns an instance of the AuthorApp, which we can use to programmatically drive authoring using its public methods. From here, try modifying the example files and take a look at some more in-depth options and tutorials for using Learnosity authoring functionality. For lengthy discussion of authoring concepts, refer to Learnosity tutorials. To learn more about the authoring feature set, see the authoring index page. View interactive authoring demos in the Author API demos.